oupiPaint from modelersoft.com is a paint tool designed to produce quality drawings with realistic rendering on your computer. Particular care was taken to ensure that the software remains efficient in all circumstances. The ease of use of YoupiPaint is our major concern for you to focus on your drawing rather than the program. Using YoupiPaint you will have the same feelings and the same pleasure than to draw on a real canvas. 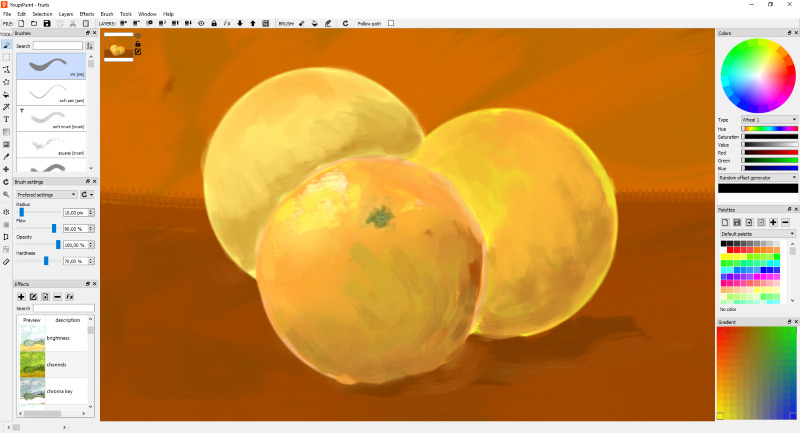 Drawing surface: infinite canvas, infinite layers, undo/redo, background papers, move, rotate, scale the surface. Brush engine: 50+ predefined brushes, pen pressure sensitivity, user brushes fully customizable, add, remove, duplicate, import, export, sort. The brush engine studio allows to develop your brush engines. Colors: swatches, palettes, color wheels and panels, color generators, gradient panel. Tools: brush, selection (rectangle, ellipse, polygon, path, free form), 40+ predefined shapes with stroke and fill, text with stroke and fill, shapes and text are transformable into selections, line, polygon, curved line tools, fill tool, pattern fill tool, magic wand selection tool, gradient tool, image tool (import/export, copy, paste). color picker, symmetry tool with up to 30 symmetry axes, perspective tool, comic strip tool, ruler tool, timeline tool, allows to animate your drawings. Effects: 40+ predefined effects, fully customizable. Basic color, contrast, luminosity and many other artistic effects. The effect engine studio allows to add any effect. User experience: panels, multiple screens, save/restore layout, global window transparency, full screen, no distraction mode, contextual menus and toolbars for each tool. Performance: fully OpenGL for stunning performances, brush and effect studio use OpenGL Shader Language.